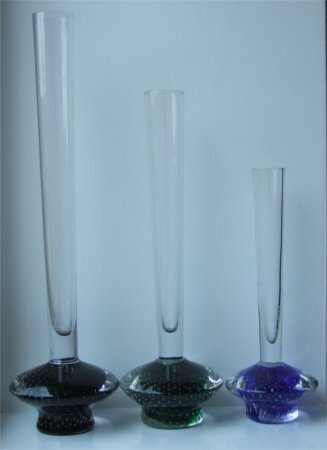 The black amethyst vase on the left is approximately 248mm (9 & 3/4") tall. The base is an unusual shape a bit like a flying saucer. (I often refer to these as UFO vases). 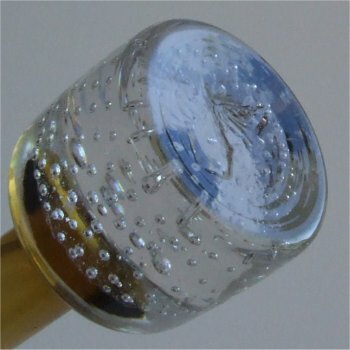 The stem is clear and has a medium flare and is approximately 25mm (1") across the top. 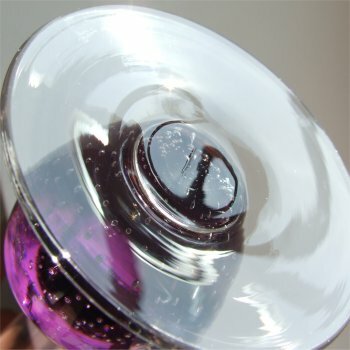 It has small well controlled bubbles in the base which come up in a spiral. The bottom of the base has a flat and polished finish. (see images below). The green vase in the middle is approximately 203mm (8") tall. 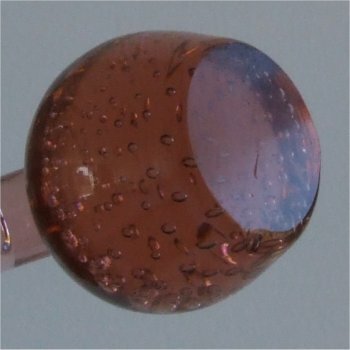 The stem is clear with a medium flare and is approximately 24mm (15/16ths of an inch) across. 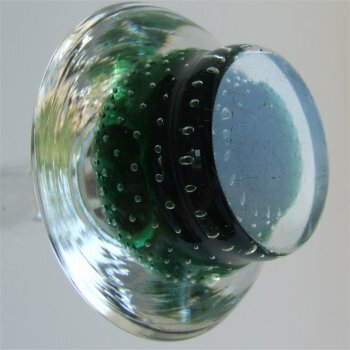 It has small well controlled bubbles in the base which come up in a spiral. The bottom of the base has a flat and polished finish. Although these vases do not have labels, I have seen a pair of green ones with labels which stated 'MADE IN SWEDEN'. 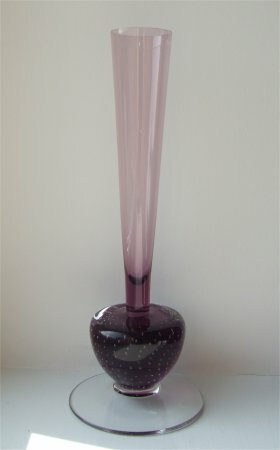 I have now aquired another green vase with a G Hardy & Co."Swedish Art Glass" label. 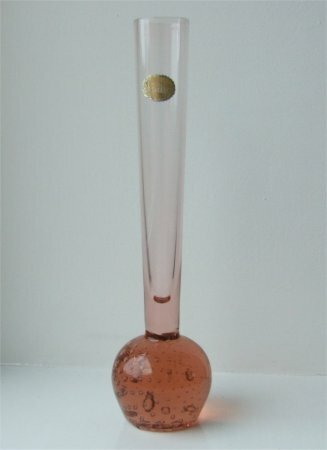 This peach vase is approximately 156mm tall (6 & 1/8th"). 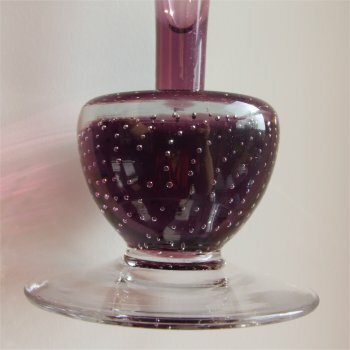 The stem is the same colour as the base and has a narrow flare approximately 21mm (13/16ths of an inch).The bubbles are controlled and a mixture of small and medium sizes and come up in a spiral. The bottom of the base has a flat and polished finish. 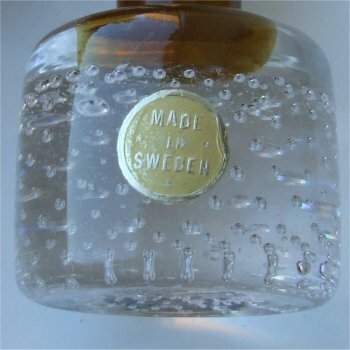 The label is a buff/yellow colour, oval (landscape), has a scalloped edge and a silver border and writing which states 'MADE IN SWEDEN'. (See images below). 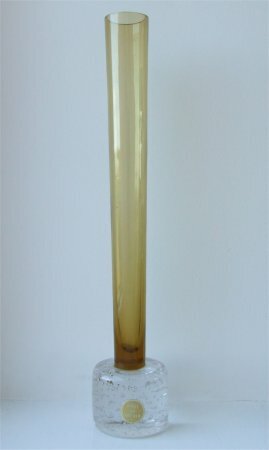 This vase has a clear base and an amber stem. It is approximately 242mm (9 & 1/2 inches) tall. 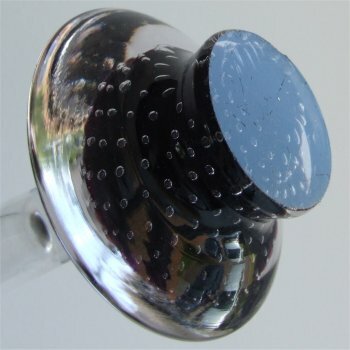 The base is a cylinder shape and has fairly small bubbles which come up in a spiral. 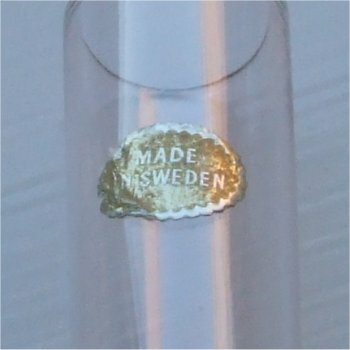 Identical in shape to the Ekenäs vases also made in Sweden. The stem has a narrow flare being 25mm (1 inch) across.